This week at JAI it's a sketch challenge. To start with, I was a bit stumped as to what to do for this since I don't have the Scallop Circle die yet. I was going to drag out my Circle Scissor Plus, (I did do that eventually anyway) but then I had another idea. The doily I picked up from the party supply shop across the road from my work. The rest came together quite quickly, suprisingly enough. I have embossed the base using an old Cuttlebug embossing folder. Because the card measures 5" x 5" I had to run it through twice. There must be a trick to that which I am not aware of because I ended up with a bit of a line in it. Luckily that doily was big enough to cover it up, lol! The sentiment is from the L3 Hostess Set, Occassional Quotes and has been stamped in versamark and embossed with Silver Sparkle embossing powder that I have had in my stash forever! Jo I was very impressed when I saw your creation using the silver doily...it so fit your wedding theme! Jo, I LOVE this!! So elegant. What a clever thing you are. Very clever idea Jo, the silver and white combo is gorgeous! This is awesome! Another one of your's I'll case, no doubt!! Just brilliant. Love the embossed sentiment on the card too. Wow! I should pay more attention when I visit party supply shops. This is stunning. this is absolutely gorgeous! i mean like.... ABSOLUTELY GORGEOUS!!! really elegant, the colours are beautiful together, perfect for a wedding card. I love this idea Jo and am off to find some doilies! Well spectacular certainly describes this Jo - wow!!! Love the subtle embossing on the background and the silver sentiment. Love it! 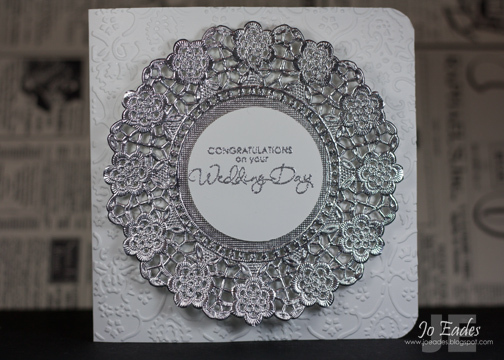 Love the blingy look of your silver doily Jo. Great card. Haha I don't know the embossing trick either because I always end up with lines where I don't want them too.